Recently we evaluated the SnoreRx device which is an over-the-counter oral appliance for the treatment of snoring. Snoring is the sound caused by a narrowed nasal and/or oral airway during sleep. Potential airway narrowing may occur in the nose and includes a deviated septum, enlarged soft tissue (turbinates), polyps, and/or sinus congestion. Narrowing in the oral airway may come from one or both places and include: 1) the back of the throat including a narrowed pharynx, an elongated soft palate, enlarged tonsils, and enlarged uvula and/or 2) the tongue falling into the airway from a small lower jaw, a bad bite, an enlarged tongue, or a crowded and smallmouth. As the air has to pass through a smaller, more narrow space, it rushes at a faster rate and vibrates the tissues, resulting in the familiar and often annoying snoring sound. The process to fit the SnoreRx was easy to follow with the clear and concise directions. To mold the appliance to the teeth, there is a handle included to avoid burns when placing the device in the boiling water. When placing the device in the mouth, the patient should bite down as hard as possible and suction the air and water to mold the material to the teeth. If needed, this step may be repeated in case of poor retention or not seating the tray all the way. The handle is easily removed and the device may then be calibrated to move the lower jaw forward. It is best to start with a small and comfortable increase of 1mm to avoid jaw pain. After 3-5 nights at each setting, the device can be adjusted as often as needed, up to 6mm of movement until the snoring is reduced. The SnoreRx website has good education, explanations, and support. The patients I utilized for this device reported ease of preparing the appliance for use, comfort while wearing, and decreased snoring. Potential side effects include tooth or gum soreness, excessive salivation or dry mouth, tooth movement or changes in bite, and temporomandibular (jaw joint) issues. If you experience jaw pain, headaches, facial pain, jaw noises, or jaw locking, use of the device should be discontinued. If the symptoms do not resolve, we recommend you see a dentist trained in TMJ Dysfunction. When comparing this device to a custom-made oral appliance, the overall size is bulkier due to the outer shell being approximately 2mm thick then containing the inner moldable copolymer. This may lead to the lips remaining open during sleep and mouth breathing or dry mouth. The dental literature suggests that the soft mouthguard material, such as the inner lining of the SnoreRx, may induce tooth clenching. If you find that you are waking with clenched teeth, facial pain, or headaches along the temples, you should discontinue use and seek an examination by your dentist if the symptoms persist. 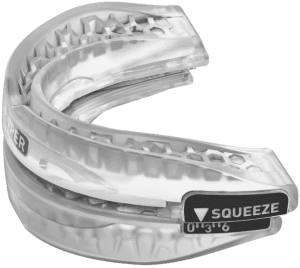 Overall, the SnoreRx is an ideal appliance to use for snoring, as a stepping stone prior to trying a more long-term custom-made oral device, or as a temporary device while awaiting a more definitive treatment method. If you or your loved one wakes gasping or has been told of stopped breathing during sleep, or has been diagnosed with sleep apnea via an overnight sleep study, treatment should be sought by a sleep physician or a dentist trained in sleep-disordered breathing rather than using an over-the-counter snoring device. Treatment methods include a CPAP (Continuous positive air pressure) machine, surgery, weight loss, oropharyngeal exercises, and custom-made oral appliances. Dr. Balatgek is the owner of the Center for TMJ & Sleep Disorders, LLC, which is a private dental practice limited to treating TMJ (jaw joint) disorders and Sleep Disordered Breathing including snoring and sleep apnea. She obtained a Doctor of Dental Surgery (D.D.S.) degree from THE Ohio State University in 1997 and a Master of Science Degree in Craniofacial Pain from Tufts University in Boston, Massachusetts in 2011.